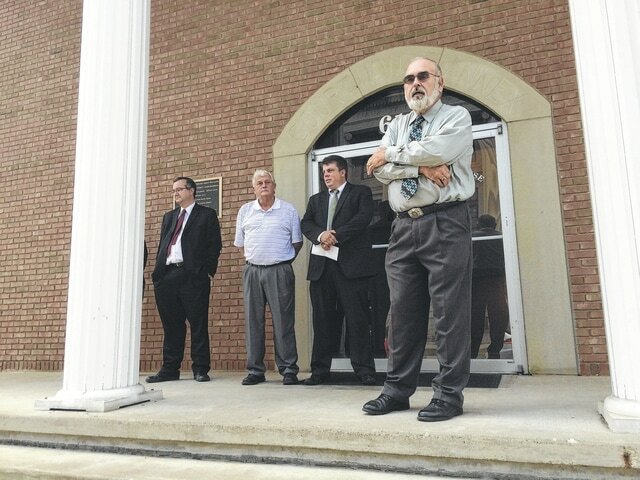 Wayne Allen | Daily Times The Scioto County Commissioners and Scioto County Prosecutor Mark Kuhn at the dedication the Courthouse Annex. As 2015 came to an end, the Scioto County Commissioners took some time to reflect on the accomplishments of their office and community. The $30 million dollar Minford Sanitary Sewer Project was completed. As a part of the project installed 30 miles of sewer mains, a new waste water treatment plant and other items. The project is estimated to provide sewage service to 1,327 existing homes, along with modest growth capacity for the entire service area. The commissioners awarded a contract Breech Construction of McDermott, for $152,295 for sewer rehabilitation and road paving in Rush Township. The scope of the work includes installing 610 feet of 24 inch pipe; installing 566 feet of 18 inch pipe and 155 feet of 15 inch pipe; 160 feet of 30 inch pipe; and 46 feet of 36 inch pipe with corrugated double walled drainage pipe. The project also calls for the finishing and setting of 12 ‘4X4’ and 4 ‘3X3’ concrete catch basins on Johnson, Maple, Sycamore, Oak and Cherry streets in McDermott. The project is anticipated to be completed within a year. The commissioners purchased the Courthouse Annex in 2015. The purchase price was $956,022, and the commissioners say the purchase will save money in the long run. At the time of purchase the commissioners also purchased an adjacent property for $200,000 for use as a parking lot. In 2015, the Scioto County Health Department started to undertake a process of mandatory accreditation through the Center for Disease Control (CDC). It was discovered the accreditation would cost the department $20,000. “It’s been mandated that all health departments must be accredited by 2020. The accreditation process is actually is through the Public Health Accreditation Board, which is funded by the Center for Disease Control (CDC) and the Robert Woods Johnson Foundation,” Dr. Aaron Adams, Scioto County Health Commissioner, said. He said it’s believed that by going through the accreditation process will improve the quality of care, improve accountability and credibility of the health department. The Scioto County Commissioners partially funded the Accreditation Manager Position within the health department. As a result of the commissioner’s action, a burden was eliminated from townships throughout the county. Adams said once the department has going through the process, accreditation could be achieved by 2017 or 2018. In 2015 several office holders including the Scioto County Auditor, Commissioners and Engineer announced a collaboration which will lead to a lot of the counties real estate information being put on the internet. Once complete the Geographic Information System (GIS) will be a collection of maps that provide relevant data on parcels of land. Commissioner Mike Crabtree, Doug Coleman and Bryan Davis praised the level of collaboration and are excited for what this system will mean to the community. “There are a lot of counties around us that have been online (with tax maps) for years. I think we’re going to have the Cadillac of the bunch because eventually a lot of departments will benefit from this,” Crabtree said. The Southern Ohio Port Authority and the city of Portsmouth have also been involved in funding the GIS system. Other accomplishments of the commissioners in 2015 include, the purchase of new computer hardware/software and phone system infrastructure for the courthouse and Sheriff’s office further increasing efficiencies in time and labor costs. Started a recycling program within the courthouse and courthouse annex. Traveled to Washington D.C. to fight for jobs, health and safety issues at the Piketon Decontamination and Decommissioning and American Centrifuge Plant sites. Began renovations on the courthouse fourth floor to relocate the County Engineer to new offices. While the list of accomplishments many be long, the commissioners are proud of their accomplishments while keeping the county fiscally healthy. The Commissioners said the general fund and a carryover above $5.9 million, which is the largest carryover in the county history. “This accomplishment would not be possible without the hard work and dedication shown everyday by our elected officials and county employees,” Coleman said. For more information about the office of Scioto County Commissioner visit, www.sciotocountyohio.com/commissioners.